The Sinn Féin leader said party members that vote against party policy in the Dáil will face consequences. 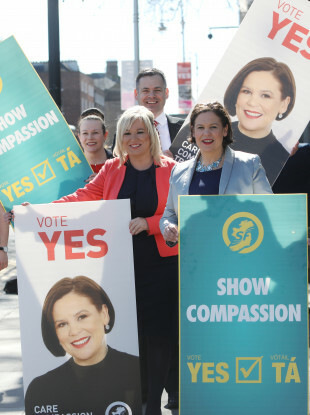 SINN FÉIN LEADER Mary Lou McDonald has said she would prefer if her party colleague, TD Peadar Tóibín, was not openly canvassing for a No vote in the upcoming referendum. She added that he was doing so in a “personal capacity”. The Meath East TD, who is a pro-life supporter, joined a group of canvassers at a rally the GPO today. His position on the issue of abortion puts him at odds with Sinn Féin policy – which is calling for a repeal of the Eighth Amendment. Today, McDonald was asked if there are double standards at play within her party. Offaly TD Carol Nolan lost the party whip after voting against Sinn Féin policy on the issue. However, McDonald said she operates a fair system and the rules are clear. She explained that Nolan voted against party policy in the context of legislation in the Dáil chamber – Toíbín is yet to do so. “Of course I would prefer and it is favourable that members, and party elected members, are in tune with the party’s position, but I acknowledge there are very different and deeply held views on this matter and I respect that,” McDonald told reporters today. However, irrespective of party members’ right to articulate their views on the issue, the party has “clearly drawn the line” on the matter of breaking the whip when it comes to legislative proposals and public policy, she added. McDonald said party members that breach the party line will face consequences. This is something all members are aware of – including Nolan and Toíbín she said. She added that Toíbín is “expressing a view that is not party policy – but he is an adult, he has a view, he articulates that view, where matters are very clearly distinct is where it comes to the formation of law and public policy”. The party leader added that if she stepped in to censor members for their views, she would be rightly criticised. “We do live in an open society and people with a strong view have a right to express it, but the line gets drawn at the point where we make law and form public policy that is the distinction,” she warned. Email “McDonald: 'I would prefer if Peadar Tóibín was not speaking out on abortion in this way'”. Feedback on “McDonald: 'I would prefer if Peadar Tóibín was not speaking out on abortion in this way'”.